Two weeks ago I attended an incredible yoga charity event I hadn’t had the chance to share with you guys! It was an amazing experience and one that I wish to continue - an event focused on the importance self-love & self-care while supporting a great cause. The event was co-hosted by Martha Kirby the founder of the digital platform Lead Like Her which aims to provide a place for creative, independent women to tell their stories, inspire others and drive change in society. 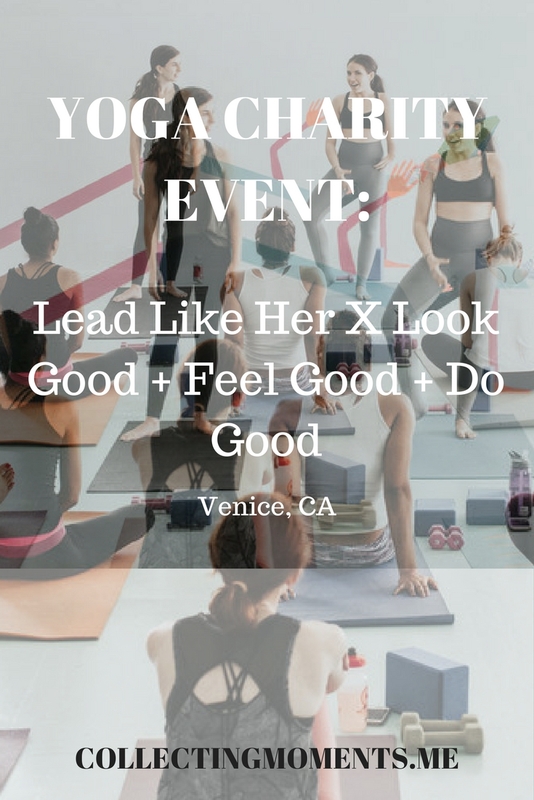 The other co-host, Kelsey Lindell, is the founder of the yoga event series Lead Like Her x Look Good + Feel Good + Do Good, which is an inspirational, girl power-fueled yoga event focusing on becoming healthier, happier, stronger individuals so that we can greatly impact the world around us. Kelsey is also the founder of the organization Uphold Global (an organization helping children with disabilities in Africa) to whom the majority of the ticket proceeds went to. THE EVENT WAS EVERYTHING! Fun, encouraging, so much fun! Let me explain all that went down. First, I signed up because like, really who wouldn't? Working out = helping others!! Def my kinda event. But also because it was shared by an amazing girl I follow on IG, Maggie, and I wanted to get to meet her offline. Also, I was obviously “convinced” (didn’t need much convincing! I was SO happy to go!but anyways) by the above description of the event AND lastly It was held at Love Yoga Venice which is walking distance from my apartment! Now, I didn’t know much about Kelsey Lindell but obviously the thought of practicing some yoga on a Saturday was fun enough. Now, why do I mention I didn’t know Kelsey -- aha! Because I was basically expecting a chill, serene, yoga flow class and I wasn’t familiar or didn’t do much research) about Kelsey’s style of teaching and her background!Which meant, HUGE AMAZING surprise for me as Kelsey taught a very hot, steamy, fast-paced yoga class!!! (we even incorporated some weights!) The class was challenging, harder than I expected and I LOVED IT! Kelsey is a very fun and easygoing person to listen to; she encouraged us to support one another throughout the tough poses, motivate and talk to our neighbors and really help, encourage and empower all the beautiful women in the room to push through it together! So cheers to a pleasant, challenging Saturday! We pushed through it, it was fun and we helped a beautiful cause! P.S - another cool fact - we got to eat some delicious Sweetgreen, Juice Served Here + received a little goodie bag with a granola bar from This Bar Saves Lives + gift card from Inflow Style too! Have you attended any similar events in your community? What are some of your favorite organizations and causes to support? I would love to hear more about them! If you liked my little summary about the event, please remember to share!